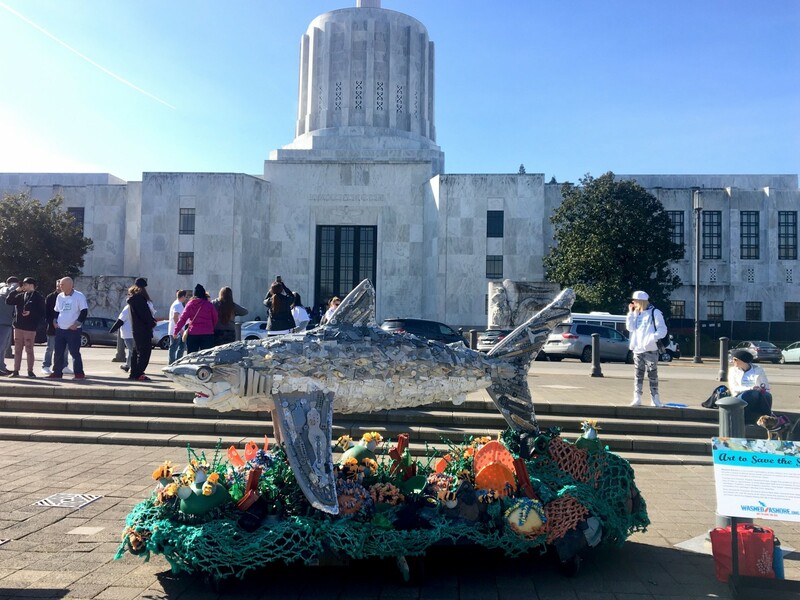 On March 14th, Surfrider Foundation Oregon, along with partners the Oregon Coast Aquarium, SOLVE, Oregon Shores Conservation Coalition, and Environment Oregon, hosted Rise Above Plastic Pollution day at the State Capitol. Hundreds of people from across the state turned out on a beautiful day in Salem raise awareness and inspire action to address the global plastic pollution crisis. Governor Kate Brown officially proclaimed March 14th “Rise Above Plastic Pollution Day” at the Oregon State Capitol. 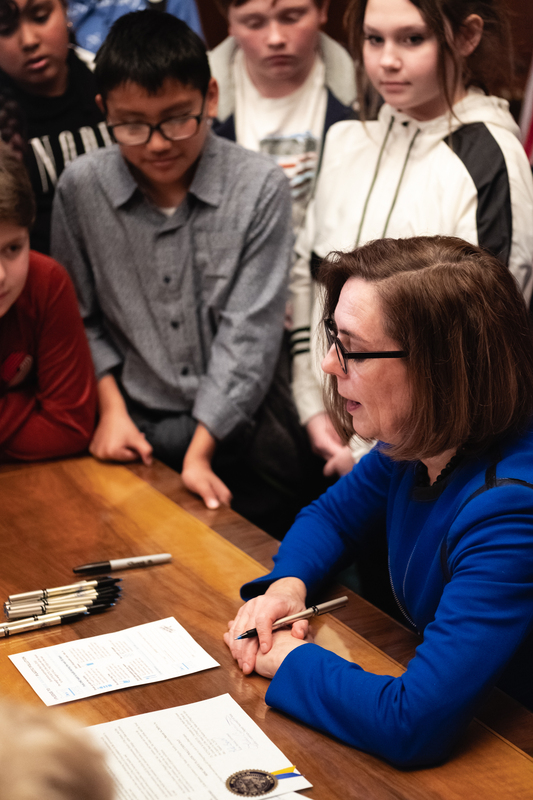 Governor Brown brought her own reusable shopping and produce bags to the signing to demonstrate her personal committment to reducing single-use plastic. When taking the pledge, Governor Brown chose to “be a smart shopper” by purchasing fruits and veggies that are not wrapped in plastic. Governor Brown taking the Rise Above Plastic Pollution Pledge after signing the proclamation. Photo by The Beans and Rice. 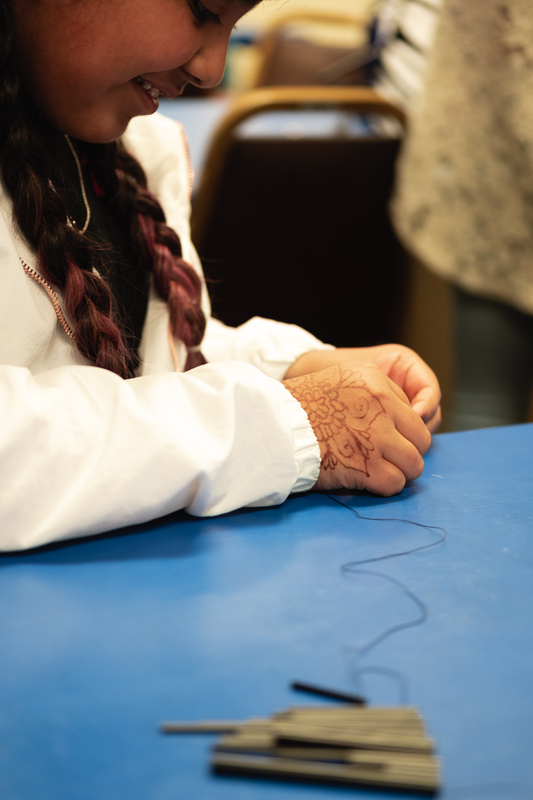 The Oregon Coast Aquarium and researchers from Portland State University taught participants about the impacts of plastic pollution while SOLVE, Oregon Shores Conservation Coalition, and Surfrider Foundation educated visitors on solutions to the plastic pollution crisis. Artists helped attendees better understand plastic pollution. Washed Ashore brought their newest exhibit, Sylvia the Shark, for visitors to see and Nancy Judd invited people to help build a collaborative art piece called the Rise Above Plastics Cape. The straws being used to make the cape are left over from food service establishments that now serve sustainable alternatives to single-use plastic straws. A student from Sam Case Elementary in Newport helps build the Rise Above Plastics Cape. Photo by The Beans and Rice. Sylvia the Shark, created by Washed Ashore, sits in front of the Capitol. Photo by Elizabeth Roberts. More than 350 students of all ages from across the State attended the event. 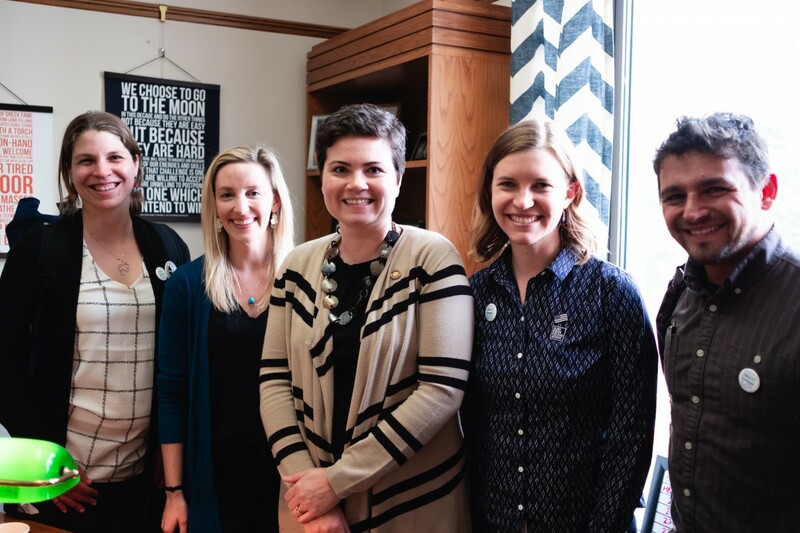 Collectively, the students and event volunteers met with more than 40 legislators and to ask our elected officials to emphasize how important this problem is and to pledge to make a personal committment to change one of their own single-use plastic habits. Surfrider volunteers and staff from Portland pose with Representative Karin Powers after she took the Rise Above Plastic Pollution Pledge. Photo by The Beans and Rice. 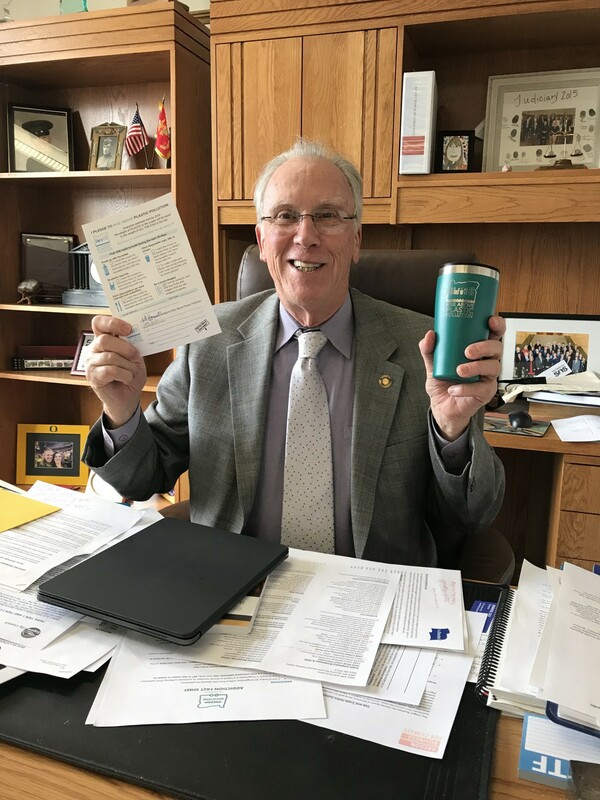 Representative Jeff Barker shows off his pledge to be a smart shopper with his new reusable mug. Both the House Committee on Energy and Environment and the Senate Committee on Environment and Natural Resources hosted a panel of experts entitled, “Marine Plastic Pollution Health and Policy.” Dr. Susanne Brander, faculty in the Department of Environmental Toxicology and Chemistry at Oregon State University, presented her research on the effects of stressors such as emerging pollutants, plastics, and climate change on aquatic organisms, touching on the links between ecological and human health. Jennie Romer, Esq., a national expert on carryout bag policy and founder of PlasticBagLaws.org, discussed policy on carryout bags from a national perspective. Rise Above Plastic Pollution Day was part of a larger Rise Above Plastic Pollution Project funded by a NOAA Marine Debris Program Prevention Grant. Surfrider Foundation and its partners are working with the public, school students, businesses, and the Oregon State legislature to reduce consumption of single-use plastic in Oregon. The coordinated project will culminate in a Rise Above Plastic Pollution Month (in May). For more information about Rise Above Plastic Pollution Oregon, or to take the pledge yourself, visit riseaboveplasticpollution.org.